The Samsung Galaxy Core I8260 was announced in May 2013 and then released in June. 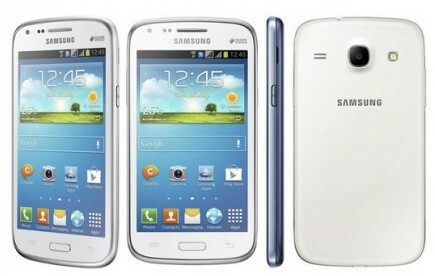 This device comes in metallic blue and chic white, similar to the S3 colors. This device has the same look and interface as the popular Galaxy S series, but just smaller. A great alternative if you’re looking for a starter smart phone! This is a single sim card device and once unlocked can be used with any compatible GSM carrier worldwide. The device has a 4.3″ TFT capacitive touch screen. It was a 5MP camera and 480p camcorder to capture your every day life. The Galaxy Core comes with 8GB of internal memory which is expandable up to 64GB with a micro SD card and a 1GB RAM. The Core is preloaded with Jellybean 4.1.2 and is not upgradeable. It has a Snapdragon, dual-core, 1.2 GHz processor and Adreno 203. With a built-in FM/AM radio and GPS capabilities, this device is pefect for you if you’re always on the go. With a removable Li-Ion 1800 mAh battery, this device gives you up to 300 hours on standby and up to 9 hours of talk time. Unlock Your Samsung Galaxy Core I8260 Today!